The objectives of soil testing are to accurately determine the status and availability of nutrients, and to clearly indicate any deficiency or excess that may exist. Soil test results can be used to determine specific crop nutrient needs for profitable and environmentally sound application of fertilizer, lime, and organic soil amendments including manure or compost. Applying fertilizer or manure without the benefit of a good soil test is like throwing money away. Without the proper guidance of a soil test, the farmer could lose profit due to lower yields or from unnecessary expenditures. The first step is the responsibility of the farmer while the next three are performed by a soil testing lab. Each step is important for meaningful results. The closer the samples are taken to planting time, the less chance there is for changes to occur. Nitrogen levels tend to vary a lot so sampling near the time of planting is best. However, soil samples may be taken either in the fall or spring. Fall sampling ensures that test results are ready in plenty of time for spring or for fall fertilization when weather conditions are good and time is not so critical. Take soil samples every 2-3 years. Keep a record of soil test results on each field to evaluate long term trends in nutrient levels. Each soil sample should be a composite of soil cores taken from a similar area. When sampling, avoid unusual areas such as eroded sections, dead furrows, flooded areas, fertilizer bands, and fence lines. Divide each field into uniform soil and past cropping areas. Assign a permanent identification name/number for long-term record keeping. Fertility trends over a period of years provide important information, indicating the adequacy of a fertilizer program (too much, too little, or the correct amount). To sample an area of one soil type, take at least 15-20 small samples or cores at random from each area to give a composite sample at tillage depth (upper 6-8 inches for most crops). For perennial pastures or hay crops (cases where the soil is not annually mixed), sample only to 4 inches deep. 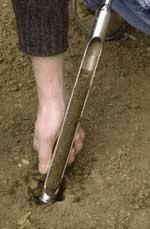 Use a soil probe or soil auger to collect the samples (see the image above). You can also use a shovel or spade for shallow samples. The subsamples should be collected into a clean plastic container and mixed together well. From this composite sample remove about a cup of soil and allow it to air drywithin12 hours of sampling. Place the sample into a Zip-Lock bag for shipping. Label the outside of the bag with your name, address, field, and intended crop. Soil samples can be sent through standard mail services to UMass Soil Testing Lab, West Experiment Station, UMass, Amherst, MA 01003. For further information contact the Soil Test Lab (413-545-2311). Note: Accurate soil tests are important for a successful nutrient management plan. Note: Soil tests are required every three years.